Blizzard has revealed the latest hero to join the ever-expanding Overwatch roster: gunslinger and apparent long-time acquaintance of McCree, Elizabeth Caledonia “Calamity” Ashe – or Ashe for short. 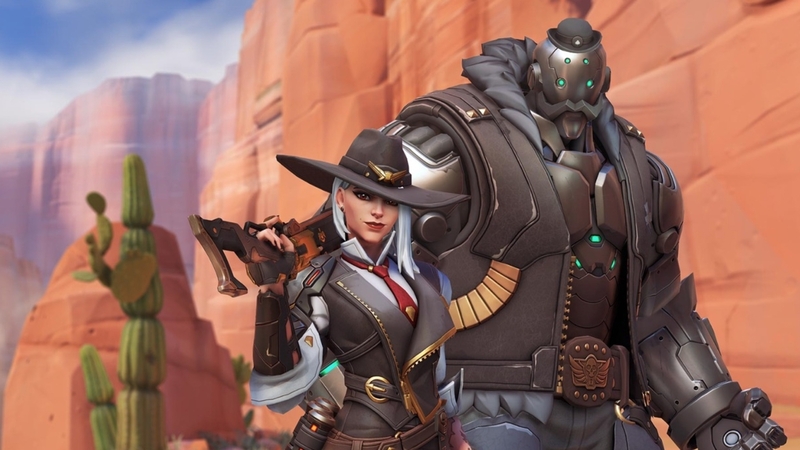 Ashe was unveiled in Blizzard’s latest Overwatch animated short, Reunion, which aired during the BlizzCon 2018 opening ceremony. Here, McCree and Ashe’s paths crossed in explosive fashion (with Route 66 looking a bit worse for wear by the end of it) as a few other new faces make their debut – including floaty robot Echo, and Ashe’s bowler-hatted metal chum B.O.B. According to the Overwatch website, Ashe is equipped with The Viper, a semi-automatic rifle that can fire either quick shots or be used via aim-down sights for more powerful, precise shots. She also packs throwable dynamite, which will either detonate after a short delay or when shot. Alongside explosive damage, dynamite can light enemies on fire, dealing damage over time. The Coach Gun knocks foes back while also propelling Ashe backward for extra mobility – and, lastly, there’s Ashe’s trusty sidekick B.O.B. When deployed, B.O.B. charges forward, shunting enemies skyward, then lays down suppressing fire with his arm cannons. There’s no word yet on when Ashe will be making her entrance in Overwatch, but hopefully we’ll have more news soon.